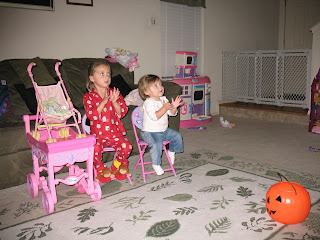 We put on Wiggly, Wiggly Christmas for Jaeden and Avery and they loved it! It was so funny to watch them clap and dance, they were both getting so into it. I love watching kids get so excited! Ok you have the cuttest little girls ever!! You make me want a girl sooo bad! Avery is absolutely delicious!!! Want to squish! Oh yeah I am officaly telling people now that we have #5 on the way!! Crazy I know-what can I say we like kids!! I am due on July 29th! I love this! Dylan isn't into TV yet, but I love when Tyler interacts with it and cheers and dances. What cute girls!